Clayton & Brewill offers a streamlined accountancy and book-keeping service for businesses and individuals looking for an effective, intelligent solution at an affordable price. Tax returns, VAT returns, accounts preparation.. Clayton & Brewill have got you covered! If you run a small business and want the reassurance that your accounts will be prepared and returns filed in a timely and cost-effective fashion, the dedicated service C&B Comply from Nottingham accountants Clayton & Brewill may be for you. You’ll get a single point of contact within the team, all our usual attention to detail and the reassurance that you are complying with all your statutory accounting requirements. Photo shows left to right: Charlotte Purnell, Jacob Walker, Emma Hunt, Adam Rostance, Hayley Purdy, Vince Selke, and Catherine Sharp. Simply let us know where you need help – from managing your bookkeeping through to your annual accounts and tax return, and we will give you a fixed price quote. 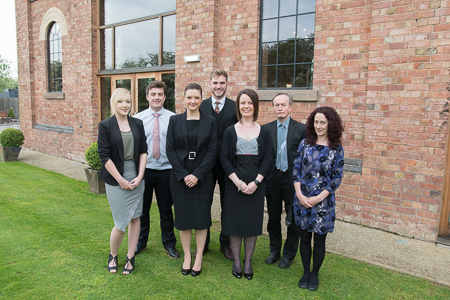 You will have a dedicated point of contact in the Clayton & Brewill team, who will remind you of all the relevant deadlines and ensure your documents are prepared and submitted on time. And, if you need more complex support or advice then we are here when you need us. We use a Sage based accounting system but are happy to work with whatever system suits you best, whether this be an excel spreadsheet or your own accounts package. To find out how Clayton & Brewill can take the hassle out of your personal or business accounts work, contact us by email or on 0115 950 3044. 31 January self-assessment – HMRC says no excuses! Are your new tax codes correct?